How do deaf people listen to music? This is the question I hear, pretty much on a regular basis. ‘I’m normally sashaying my hips wildly, gesturing to the reflection of good old handsome me in the window of the tube carriage while I’m hanging off the bar from the top and lip syncing to S Club 7’s ‘Reach’. But really, how do I hear music? I can’t exactly place ear buds in my ears to sit calmly away to Steps (another awesome band) as I pretend to be the cool hipster Londoner with skinny jeans and slips ons with no socks. I have a secret weapon. One that sometimes have people wondering I work for the secret service, sometimes that I’m a robot or that I simply have people in awe. 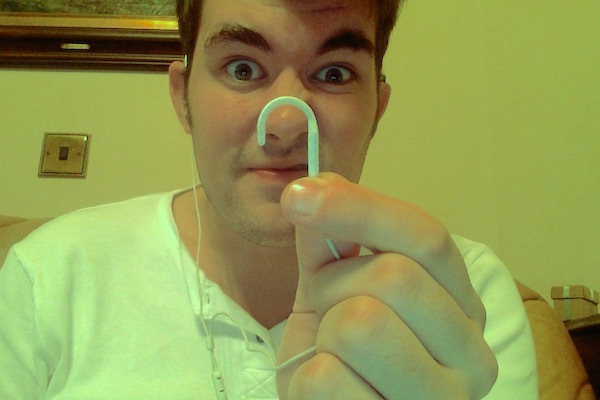 I have induction loop hook headphones. It’s rather self explanatory. Rather than buds at the ends, I have hooks. I simply place the hooks on top of my ears next to my hearing aid and cochlear implant and turn both devices to the ‘T’ loop setting. That way, all sound is turned off and my devices tune into the induction loop field generated by the hooks that blares out a frequency where I can clearly and loudly hear music blaring from my music device, whether from my iPhone or a Walkman. It’s really easy and fun. I couldn’t live without my music. I grew up listening to all cheesy bands and I couldn’t have it any other way. So when I started travelling, those hook headphones when into my bag first. Many a bus journey through SE Asia and South America, flights across Australia and New Zealand, phone calls in Africa, plugging into audio tour guides in Europe and raving to music to my amplified listeners at musicals in USA, I would have my inducted hook headphones at the ready. Hello indeed. And that’s how deaf people listen to music. What terrible taste in music?! Interesting post! Love hearing about innovations in accessibility. These are very neat!